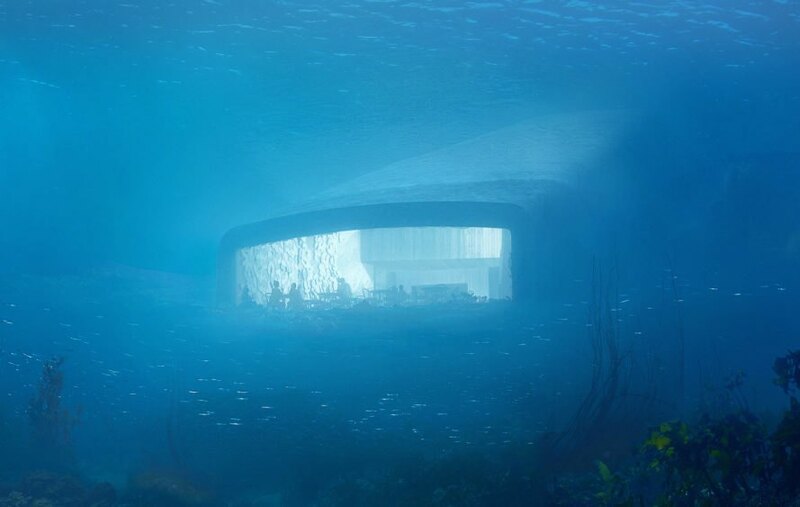 Snøhetta just unveiled plans for Europe’s first underwater restaurant, which will put a new spin on the meaning of “dining with a view.” Planned for a site off the coast of Norway, “Under” is a submerged restaurant that will offer spectacular views of the seabed while doubling as a research center for marine life. Advanced heating pump technology that taps into the seabed’s thermal mass will maintain the restaurant’s comfortable interior temperatures year-round. 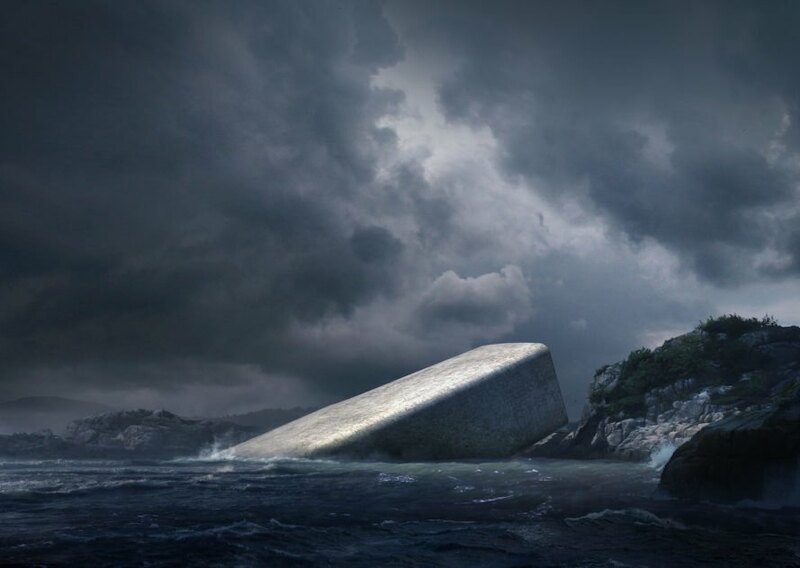 Under—which translates to “wonder” in Norwegian—will be housed in a monolithic concrete shell that appears to have sunk halfway into the sea. 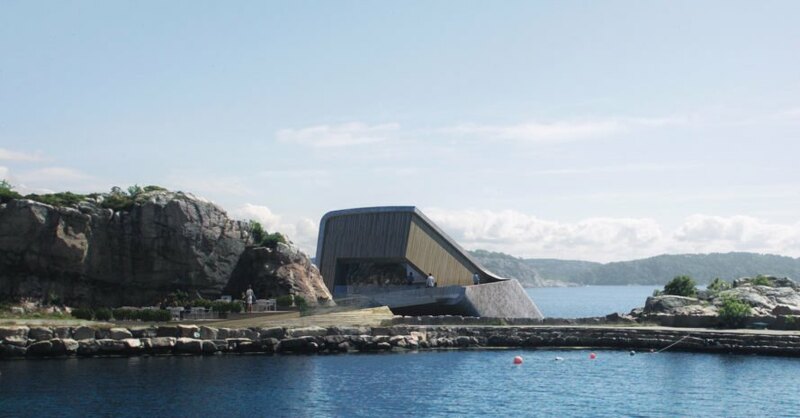 Located by the village of Båly at the southernmost point of the Norwegian coast, the building will rest directly on the seabed five meters below the water’s surface, where it will become an artificial mussel reef as a water-purifying mollusk community attaches to the building’s coarse surface. Meter-thick concrete walls will protect the structure from pressure and shock in the sea, while an 11-by-4-meter panoramic acrylic window frames views of the seabed and wild fauna. The presence of the most invasive and destructive species on the planet will be anything but benign especially when coupled with monetary investments that demand financially viable sustainability and or lucrative payoffs unless and until it is solely meant for research that is not sponsored by vested interests. 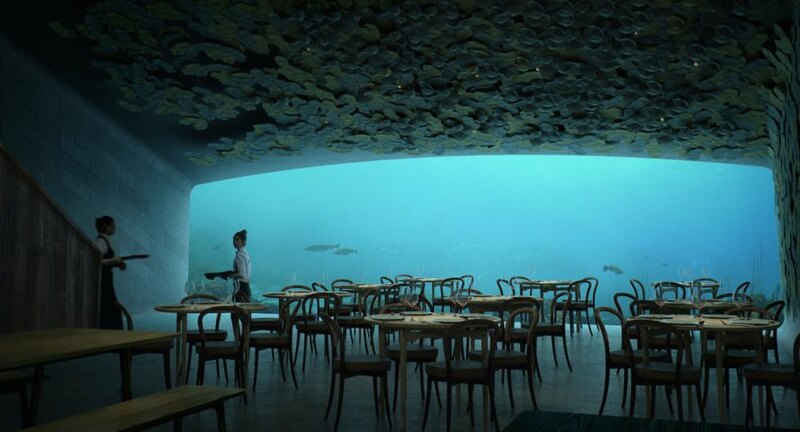 Europe’s first underwater restaurant offshore of Norway will put a new spin on the meaning of “dining with a view.” Snøhetta just unveiled designs for “Under,” a submerged restaurant that will offer spectacular views of the seabed and double as a research center for marine life. Advanced heating pump technology that taps into the seabed’s thermal mass will maintain the restaurant’s comfortable interior temperatures year-round. Under—which translates to “wonder” in Norwegian—will be housed in a monolithic concrete shell that appears to have sunk halfway into the sea. 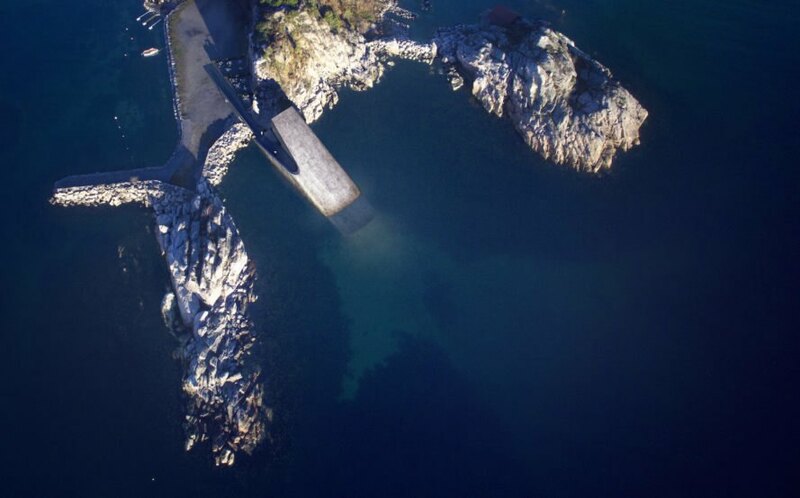 Located by the village of Båly at the southernmost point of the Norwegian coast, the building will rest directly on the seabed five meters below the water’s surface, where it will become an artificial mussel reef as a water-purifying mollusk community attaches to the building’s coarse surface. Meter-thick concrete walls will protect the structure from pressure and shock in the sea, while an 11-by-4-meter panoramic acrylic window frames views of the seabed and wild fauna. Visitors to Under will enjoy locally sourced seafood fare prepared by Danish chef Nicolai Ellitsgaard Pedersen as well as an educational journey thanks to informational plaques mounted along the trail to the restaurant entrance.